I’ve really never considered myself a pet person. I think my parents would laugh, then shudder, to hear that because my brother and I banded together on very little as children, but one of those things was the acquisition of pets. My parents were powerless against the combination of our good behavior and camaraderie, and we always won. A pair of gerbils born after the pets in my third grade class turned out to be male and female instead of two males? Two of the meanest, most bitey rescue rabbits imaginable? A whole flock of finches saved from a college dorm? A turtle found on the side of the road during an early morning dog walk? Oh, and dogs? Of course we had dogs. My earliest memory is actually the acquisition of the first dog my brother and I owned. He was a mutt fox terrier we got from the pound when I was three, and although I don’t know whether he came with the name Spot or I gave it to him (he was white with brown spots – I never claimed to be a genius of subtlety), I remember standing in the parking lot while my brother received enthusiastic doggy kisses. That memory might as well have substituted itself for Spot’s entire life. I lived with him, but his love and adoration were saved exclusively for my brother and mother. He was a good dog, but he was, to me, like a roommate I never got to know very well. When he died (at quite an advanced age), I called my best friend up and found out the cat they’d had since she was tiny had died on the same day. That cat had been ornery and mean, and had loved my friend’s older sister to the exclusion of all others, but we were both still sad. A few months later, we rescued another dog, an Airedale terrier mutt, who had been saved from an abusive home where she’d been chained beneath a porch, cut across the head with a knife, and taught to bark ferociously at men in uniform. She’d had a whole litter of puppies under there too, and even though she was big and sort of ugly (we affectionately called her Frankenstein for many years), she was a love. By the time we got Shady Lady, my brother had left for college, and I was able to win her affection more readily. She would occasionally sleep on my bed, although the slightest noise would send her careening downstairs barking. I left to go off to school a year later though, and she became very much bonded to my parents, and then, of course, my brother, when he moved back to town. When she passed away in 2010, my parents decided to wait until after my wedding to get another dog. They didn’t want to be traveling too much while helping the new dog adjust. It was a tough year for them, and it was the first time I clearly understood that I was not a pet person. It was unbearable of my parents to live without a dog. When they rescued Willie (the beagle) in 2011, it was like a light came back on in their lives. Even though his nickname quickly evolved into Wily Willie (Google “beagles stealing food” to have some idea of what my parents willingly go through for this animal), they adore him. That same year, I was out for a run and I came across a dog running loose in my neighborhood. It didn’t have a tag or a collar, and I had no cell phone to call for assistance. I stopped only because he seemed to think my running was a game and kept sprinting into the street – an act that earned me dirty looks from passers-by. After about fifteen minutes, a man walking his dog came by and reprimanded me for not keeping my dog on a leash. I explained to him, almost in tears, that he wasn’t my dog, that he snapped at me when I tried to get close, and that I really didn’t know what to do. Fortunately, he lived across the street and was able to get the dog into his backyard and took over all responsibilities from there. When I called my brother, he immediately asked me why I didn’t just make a lead out of my belt. I explained to him that sweatpants don’t generally have belts, and he proceeded to give me a lecture on all the ways I could have helped that dog. My brother doesn’t understand; he’s the dog whisperer and has, on many occasions, jumped out of his car into traffic to rescue animals. He will then spend hours caring for them while searching for their owners. I, on the other hand, barely notice that animals exist. I like them, sure, but I don’t feel that deep bond. 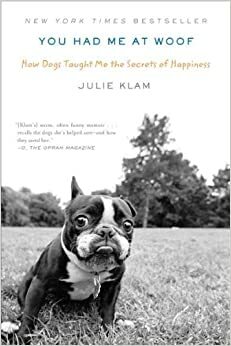 That was part of the reason I wanted to read Klam’s memoir. I thought it might give me perspective. I wanted to better understand the pet people I came from, and she is very much like them. She’s a wonderful writer, funny and poignant, and I’ll admit I cried through about a quarter of the book. When it was finished though, I felt, if anything, more alienated from my family. Pet people are a certain kind of wonderful. They’re crazy, but it’s a warm, fuzzy crazy. Reading about it made me feel a little monstrous. How could I be so indifferent? And yet…I am. Sure, I’ll take a doggy cuddle now and then, and yes, my husband is trying to convince me that we need to adopt a cat, but honestly, if I never had another pet, it would be fine. Good, in fact, considering that my father took responsibility for just about all the pets I ever begged for (aside from the dogs, who are members of the family). For more about Julie Klam, head here. Everybody has some thing(s) they’re a little crazy over–pets, hobbies, sports–but there’s nothing wrong with quiet take-it-or-leave-it enjoyment. My dogs are pretty much my children, so I’m definitely like the author of this book. So you don’t connect with pets? NBD. Some people just don’t. I can’t read books like that though, if you were crying halfway through. I cry at the drop of a hat when anything doggie comes up. You would be bawling. I was a mess!